Taking on the role of caregiver for a senior loved one can lead to stress and eventually burn out. The change in family dynamics, financial concerns, disruptions to the household routine, and the added workload of caregiving all contribute to caregiver stress. 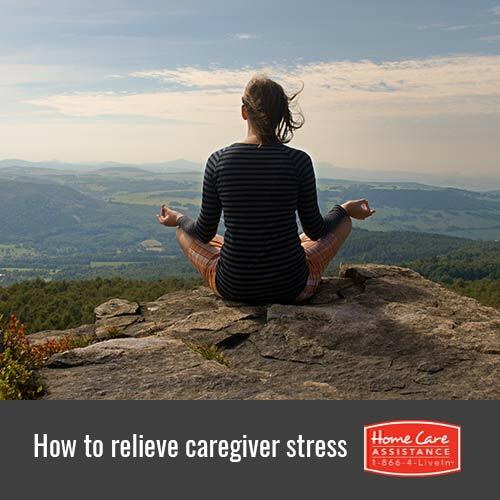 It is important to manage stress if you’re a caregiver in Oshkosh and luckily there are numerous ways to diffuse it. This is the most important thing you can do to reduce stress. When it becomes challenging to take on caregiving alone, consider asking for help. Call up a close friend or relative and ask him or her to relieve you on a regular basis. If that isn’t possible, reach out to Oshkosh Home Care Assistance for live-in, hourly, or respite care for your loved one. It can be challenging to exercise when you are under stress, but the benefits outweigh the inconvenience. Regular exercise boosts your mood and relieves caregiver stress. Even something as simple as a brisk daily walk can help boost your mental state while taking in some fresh air. A diet rich in fruits and vegetables, lean protein, healthy fats, and whole grains will keep your energy level stable and prevent dramatic highs and lows that make it challenging to get through the day. Healthy foods will also stave off malnutrition and illness associated with it, which will make you a more effective caregiver. Aim to spend at least 30 minutes each day doing something you enjoy. This can be something as simple as reading a book or watching your favorite TV show. Setting aside time for yourself will give you something to look forward to and keep burnout at bay. By implementing these ideas, you can reduce the level of caregiver stress you experience. If you begin to experience signs of burnout, such as reduced energy, becoming ill, or acting impatiently toward your loved one, may need a more substantial break from caregiving. Home Care Assistance provides flexible services including Alzheimer’s, dementia, stroke, and Oshkosh Parkinson’s care for seniors. Whether your loved one needs home care on a live-in or hourly basis, or you simply need respite care to regroup, we will help. Call us today at (920) 710-2273 to speak to an experienced Care Manager and schedule a free consultation.